Linda Sebezo (sometimes credited as Linda Sebenzo) is a South African actress, dancer, singer and director best known for her starring role as Koko, the senile grandmother who raised Lebo (Mahlubi Kraai), in the SABC1 sitcom Gauteng Maboneng. Her acting profession began in 1980 with Gibson Kente Productions. Since then she has toured nationally and overseas and has extensive television experience which includes roles in such shows as Generations, 'Sgudi 'Snaysi, Hlala Kwabafileyo, Kwakhala Nyonini, Ashiffa Shaba, Gaz'lam, Muvhango, Soul Buddyz, Isidingo, Backstage, Rhythm City, Stokvel and Intersexions. In 2009 she directed two of Gibson Kente's plays: The Call and Mfowethu. She has also been involved in the adjudication and development of young artists into professional dancers, singers and actors. She has also featured as a lead actress in various stage plays including Money Maker, Location 1973, iPi Ntombi, Love, Crime and Johannesburg; Julius Caesar, Ababemi, Ziyabheda, Things Are Bad Mzala, Wemame, What A Shame, She Fears The Night, No Peace In The Family, Mfowethu, The GK's, Hungry Spoon and Die Pakkamer, which she received a nomination for. She also starred as Nondumiso in the e.tv drama series eKasi: Our Stories, in the episode entitled "Mkhuseli", in 2010. 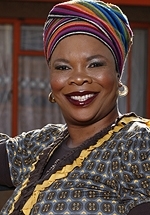 In 2012 she appeared in eKasi for a second time in the role of Mrs Letoaba, in the episode entitled "Inheritance". In 2013 she starred as Ma Josephine Rannko in the Mzansi Magic sitcom Samsokolo and the following year guest starred in an episode of the SABC1 docu-drama Ngempela. Also in 2014, she had a starring role in the SABC1 drama series Sticks and Stones. In 2017 she had a starring role as Sis Dina, an ex-beauty queen who lives on her past glories, in the SABC1 sitcom Rented Family.